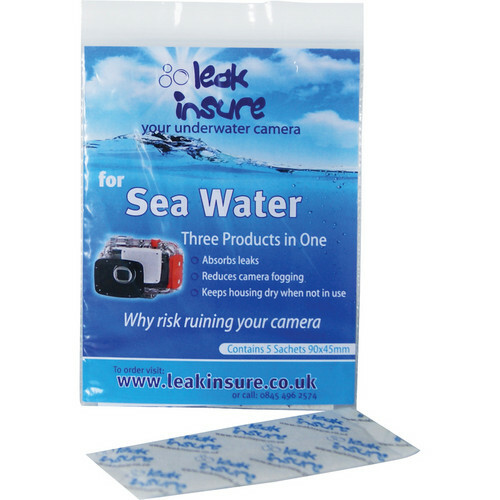 Keep your DSLR or video camera safe and dry on your dives with this 5-pack of standard-sized Leak Insure Protective Absorbent Sachets. Each of these teabag-like pouches can expand and hold about 40 ml of liquid, making it perfect for absorbing sea water and moisture inside your underwater housing. The fast-acting granules in the sachets go to work right away in the event of a leak--buying you invaluable time to get above the surface and prevent damage to your camera and lens. These packets are especially designed for salt water, so they'll safeguard against both water damage and corrosion. By reducing or eliminating condensation on your housing and lens, the pouches also improve your visibility and enable you to capture clearer, sharper images. Even when you're not using your housing, you can drop one or two of them inside to keep it dry. Additionally, the sachets are reusable after you dry them, making them a convenient and economical option. Box Dimensions (LxWxH) 4.5 x 3.4 x 0.3"